No lighting toolchest should be without the new compact, versatile Profile Panel RGB color panel from American DJ. A multi-use high-output indoor LED color-changing panel, the Profile Panel RGB casts smooth color washes to create the perfect mood at nightclubs, theaters, weddings and special events. 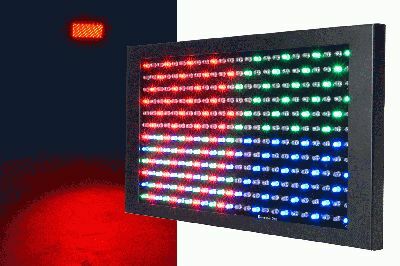 Then, when the evening heats up, this “two-effects-in-one” panel can transform into a disco light, stepping up its color changing pace, strobing in every color, and chasing to the music via exciting built-in programs. Small but powerful, the Profile Panel RGB is armed with 288 5mm LEDs (96 each red, green and blue). Its LEDs can be blended through RGB mixing to create virtually an infinite number of rich colors, with a smooth even wash field that looks great anywhere -- from live theater performances to indoor architectural applications. As affordable as it is adaptable, the Profile Panel RGB has a suggested retail price of less than $200. Its versatility, compact size and low price tag should win it a large following among many different types of lighting users, said Scott Davies, General Manager of the American DJ Group. This is especially true today, since there’s a growing trend to use more color washes as uplighting at all kinds of venues and events, Davies noted. There are a lot of different options for operating the Profile Panel RGB, making it an ideal piece for novice and experienced lighting users alike. A DMX compatible unit, it can be run in 7 different DMX modes – 2, 3, 4, 6, 7, 24 & 27-channel – giving operators varying degrees of control over its functions. A convenient 3-button LED display on the rear panel helps users navigate through its DMX settings. It can also be run without a controller in Sound-Active mode to its own high-energy built-in programs. Multiple Profile Panel RGB units can be linked together Master-Slave. Remote control is also a possibility since the unit comes equipped with a ¼” input for American DJ’s universal UC3 remote controller (sold separately). However you operate it, the Profile Panel RGB is a great tool for adding color wherever it’s needed, whether uplighting objects and surfaces, or energizing the dance floor with eye-popping effects. Featuring a 40° beam angle, it includes 0-100% electronic dimming, a color strobe effect, and fast or slow color change operation. The Profile Panel RGB also ideal for illuminating stage shows, because its cool-running LED lamps don’t emit a lot of heat onto performers the way traditional theatrical lights do. This LED technology offers other benefits as well, such as a long lamp life (rated at 100,000 hours) and low energy usage (37-watt power draw), allowing users to save big on maintenance and electricity costs. Lightweight and extremely portable, the Profile Panel RGB measures 16.75”L x 9.5”W x 2”H/425 x 240 x 51.5mm and weighs 7 lbs. / 2.9 kgs. It comes with a versatile mounting bracket for hanging either on truss or a wall. The MSRP of the Profile Panel RGB is $199.95.